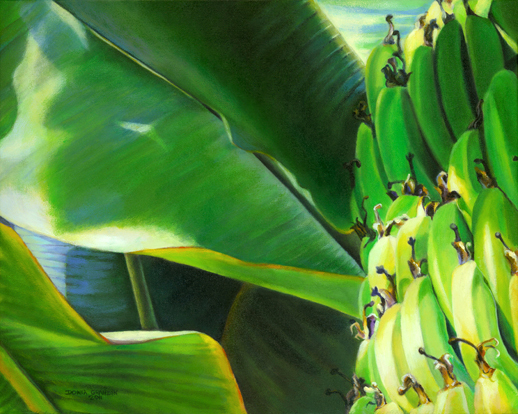 Madras banana in rain, 20″x16″, acrylic on canvas, ©2014 Donna Grandin. $800. The plaid design in this painting is not arbitrary, in the sense that any St. Lucian will read it as Madras, a component of the National Dress of St. Lucia. October is Creole Heritage month, and many patriots like to dress up in Madras (from the traditional full outfits to the more modern use of the fabric in accessories like ties, belts, earrings or handbags) for the Jounen Kwéyol celebrations. Especially in the last decade, the fabric has become a symbol of National pride. 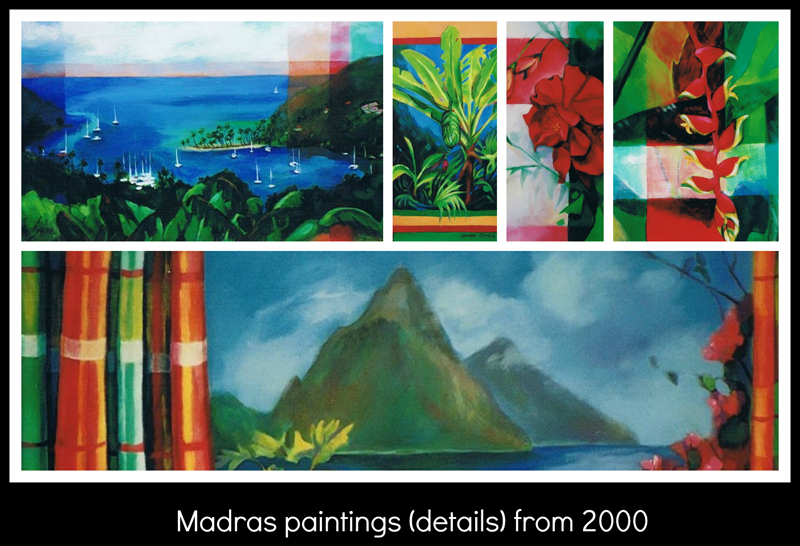 In 2000, I did a few paintings which I refer to collectively as my Madras series, however they were created one by one in between my other projects as I tried out different concepts incorporating the pattern. 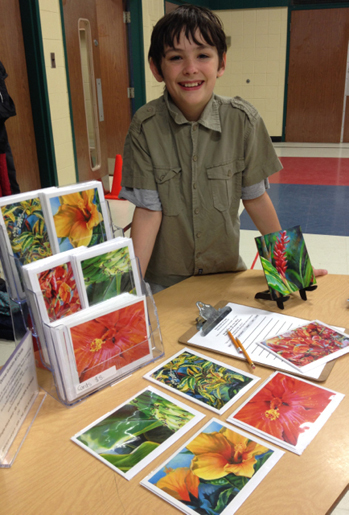 My favourite of these experiments is the heliconia on the top right of the image below. 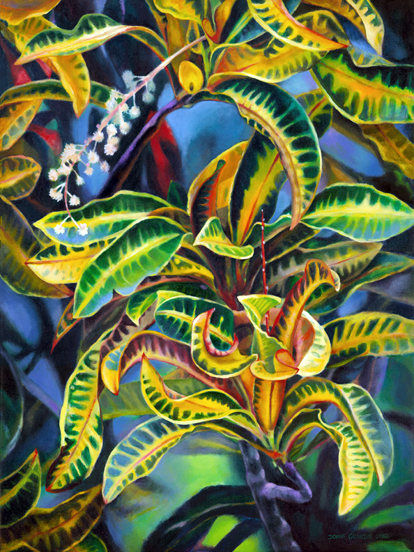 I liked the semi-abstract effect of the broad bands of colour against the tropical vegetation, and always intended to return to this theme one day. Then recently someone challenged me to do a new version of Madras Banana (first image in the collage below). 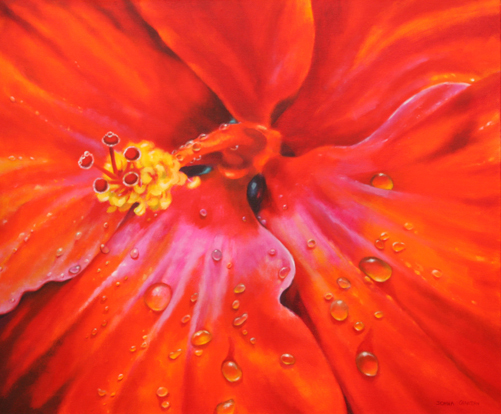 She liked the way I painted the Madras border around the banana tree with some of the leaves overlapping, but was also a fan of the raindrops in my hibiscus painting, “Precious gems”. 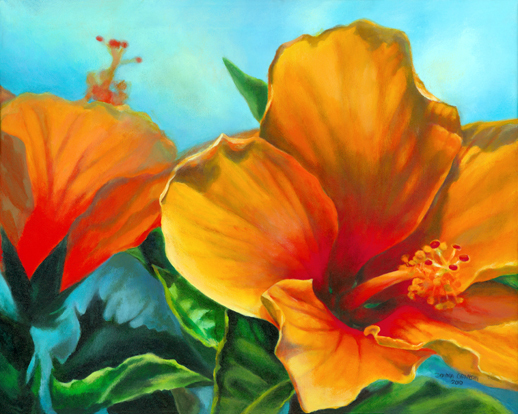 I started with a simple pencil thumbnail sketch, then primed the canvas with golden ochre acrylic paint. Next I took a look at a swatch of Madras fabric that I purchased in St. Lucia many years ago, to choose the colours for the border. 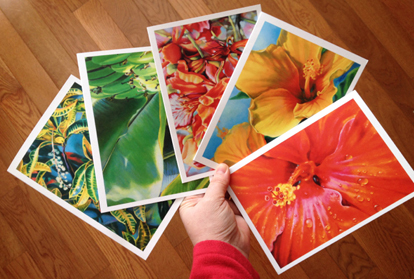 Over the last 2 decades I’ve taken many photos of tropical vegetation, so it took a while to search through my digital files for reference photos, but I settled on the one in the photo collage above. Then I proceeded to lay in the general composition based on a combination of my thumbnail & the photo. 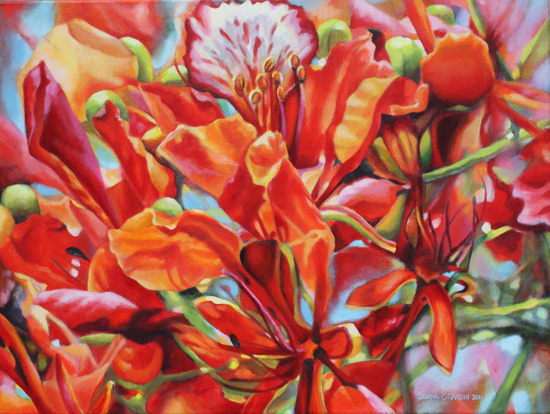 Once I blocked in the general areas of colour, the image started taking shape. 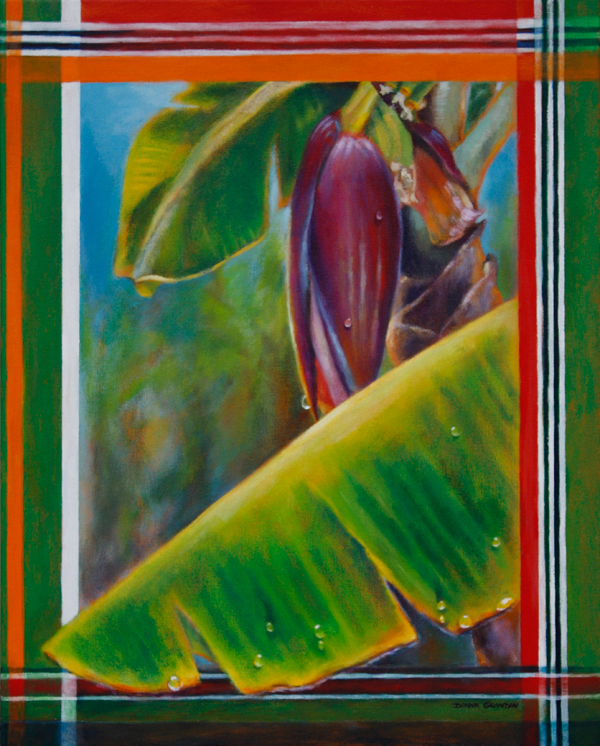 Unlike the original painting, which was a more distant view, in this painting I placed a banana leaf in the foreground, so that I could add the raindrops. The painting evolved slowly, I would think I was done, but then something would not feel quite right, so I would come back & work some more on it. That’s how it goes sometimes, painting is a dialogue … you may think you need to make just one little change, but when you step back to look at what you’ve done – that little change may affect the way you see other parts of the painting – and now you may discover you have a few MORE little changes to make! 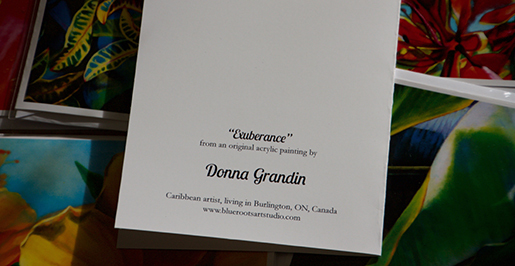 This painting is currently available for International Shipping – in a mailing tube – from my studio in Burlington, Canada. Or for local pick-up or delivery. 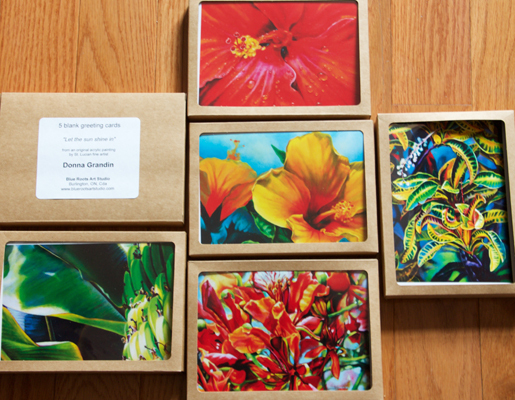 E-mail donna@bluerootsartstudio.com if interested.